Moving along in our commonly available systems, we move into one of my favorite old school games; Dungeons and Dragons. Technically speaking, I could probably make this a 5 part post considering all of the versions of it out there and maybe even more if I consider revisions. In the spirit of going with what is commonly available at the stores however this really needs to only tie into 2 editions… 4th edition and Essentials. Bashing the game for its inadequacies is as old as time itself and yet it still manages to hang in there with the best name recognition out there. Game System: 4th Edition & Essentials. Technically they both use the same system although essentials is a bit of a step back in simplicity and game nostalgia with the available classes. It’s also a good opportunity to correct all the errata that 4th generated. Love it or hate it, I think it plays very similarly to world of warcraft with its abilities and style. General Setting: Vanilla fantasy with a modern theme, although a tremendous number of well defined settings are available: Darksun, Forgotton Realms, Al-quadim, Ravenloft to name a few. The settings a quite different from each other and you should be able to find a setting style you like with a little bit of looking. If you’re into custom worlds, that is essentially fully supported through templating. Detail Focus: Combat, Adventure and Exploration. The original game themed somewhat in the reverse order, 4th and Essentials are very much a fighting game at heart. The system is designed to be used with miniatures and is a miniature tactical combat simulator. Abilities and classes are well defined as is their role within the group. D&D is very well setup to be a team game, with everyone covering each others weaknesses and playing to their strengths. System Difficulty: Moderately difficult (6 of 10.) Dungeons and Dragons is a game of rules and abilities… and there are a lot of them to learn. Even at a basic tactical level it is very helpful to have someone showing you the ropes until you figure out what you’re doing. This is particularly important since you’re supposed to be working as a team. Kid Suitability: Moderate to Well. Depends on their age…how well they are able to grok what they are supposed to be doing. The team aspects and elements work well for kids in my opinion, as roles are pretty clearly spelled out. The setting is not particularly horrific or flowery and plays well as it’s supposed to… epic fantasy. Cost: $20 to get started for essentials. More for 4th Edition which you’ll probably be picking up eventually. Other Notes: I haven’t played a whole ton of 4th Edition as I’m more of a 3rd edition guy. Wizards of the Coast owns this, so it’ll be interesting to see what direction they take the game as far as online support and how long the current edition sticks around. Most schisms in this game focus around the various editions. Love it or hate it, the game pays to be somewhat familiar with as it’s been around forever and is widely played in one form or another. 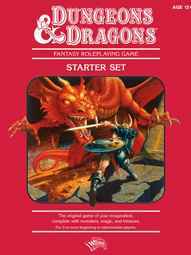 Tags: Dungeons & Dragons, Role Playing, Systems, WotC.